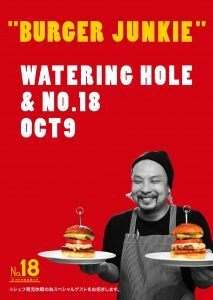 will cook his famous burger in Watering Hole only on Oct 9th. Born in 1982. Graduated Musashino Art University. and decided to be a burger chef. Opened [No.18 Dining & Bar] in Ikebukuro 2014. Working Hard to get a first Michelin star as a burger place.